Well I've got the Winter blues today! 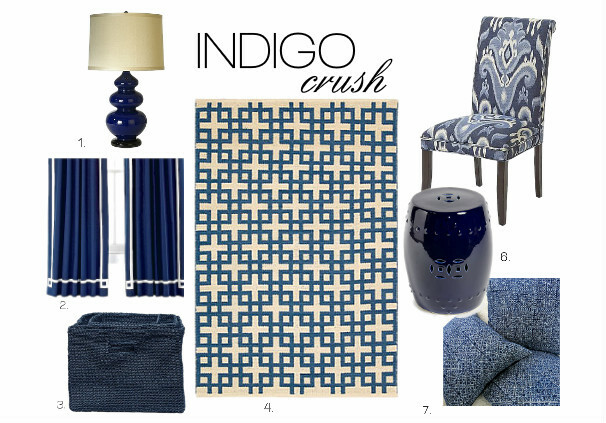 And a sure fire remedy for that, at least for me, is to create a mood board ;) Lately I've been swooning over the chic hue...Indigo Blue. Kind of like the color coral, Indigo Blue is a hard shade to define. It's basically a navy blue, but a tad lighter, yet a little darker than cobalt blue. Well however you describe it, here are seven fun decor picks all with pattern, texture and of course vibrant color! Ahhh, how chic are those greek key Jonathan Adler curtain panels from JC Penney? And they're on sale! And did you know they come in 95" lengths? Yup, they'll make your ceilings look tall! You know how much I love this color right now Jane! Love the board and all your finds! Thanks Vel, I love it too! love this! I'm definitely wanting to escape the winter blues!